During the first half of the twentieth century, Wall Street believed that companies existed primarily to pay dividends to shareholders. However, over the past 50 years, society has witnessed the acceptance of the more sophisticated notion that the profits not paid out as dividends and, instead, are reinvested in the business also increase shareholder wealth by expanding the company’s operations through organic growth and acquisitions or strengthening the shareholder’s position through debt reduction or share repurchase programs. Berkshire Hathaway Chairman and CEO, Warren Buffett, created a metric for the average investor known as look-through earnings to account for both the money paid out to investors and the money retained by the business. The theory behind his look-through earnings concept is that all corporate profits benefit shareholders whether they are paid out as cash dividends or plowed back into the company. Successful investing, according to Buffett, is purchasing the most look-through earnings at the lowest cost and allowing the portfolio to appreciate over time. Stated another way, of the $25.12 diluted earnings per share profit earned by the company, $7.00 was sent to each shareholder in the form of a dividend check they could take to their bank and the remaining $18.12 was reinvested in The Washington Post’s core businesses which included newspapers, educational services, and cable stations. Ignoring stock price fluctuation, an investor that owned 100 shares of The Washington Post common stock would have received $700 cash dividends at the end of one year (100 shares x $7 per share dividend). Logically, however, the $1,812 that “belonged” to the shareholder and was reinvested in The Washington Post’s business had very real economic value and couldn't be ignored, despite the fact that he never actually received the money directly. In theory, the reinvested profit would have resulted in a higher stock price over time. As previously mentioned, Buffett’s look-through earnings metric attempts to fully account for all of the profits that belong to an investor - both those retained and those paid out as dividends. 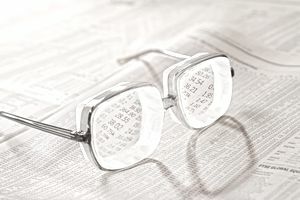 Look-through earnings can be calculated by taking an investor’s pro-rated share of a company’s profits and deducting the taxes that would be due if all profits were received as cash dividends. To illustrate this point: assume John Smith, an average investor, has a portfolio consisting of two securities – the common stock of retailing giant Wal-Mart and that of soft drink juggernaut Coca-Cola. Both of these companies pay a portion of their earnings out as dividends, but if John was to only regard the cash dividends received as income, he would ignore most of the money that was accruing to his benefit. In 2004, Wal-Mart reported diluted earnings per share of $2.03. John's dividends are taxed at 15% and he owns 5,000 shares of Wal-Mart. His look-through earnings, therefore, are as follows: $2.03 diluted earnings x 5,000 shares = $10,150 pre-tax * [1 - 0.15 tax rate] = $8,627.50. In 2004, Coca-Cola reported diluted earnings per share of $1.00. John owns 12,000 shares of the company’s common stock. His look through earnings can be calculated as follows: $1.00 diluted earnings x 12,000 shares = $12,000 pre-tax [1-0.15 tax rate] = $10,200. By tabulating the total look-through earnings generated by his stock holdings, we discover that John has look-through earnings of $18,827.50 after-tax ($8,627.50 + $10,200). It would be a mistake for him to only pay attention to the $6,630* that was received as cash dividends on an after-tax basis. Common sense tells us that the other $12,197.50 that had been plowed back into the two companies was accruing to his benefit certainly had value. Benjamin Graham, father of value investing and author of Security Analysis and The Intelligent Investor, recommended the investor insist on at least 20% to 30% additional earnings to justify selling one position and moving into another. Furthermore, John needs to evaluate his investment performance by the operating results of the business, not the stock quote. If his look-through earnings are steadily growing and management maintains a shareholder-friendly orientation, the stock price is only a concern in that it will allow him to purchase additional shares at an attractive price; these fluctuations are merely the lunacy of Mr. Market. The $18,827.50 in look-through earnings John calculated is every bit as real to his wealth as if he owned a car wash, apartment building or pharmacy. By investing from a business perspective, John is better able to make intelligent, rather than emotional, decisions. As long as the competitive position of either company has not changed, John should view significant drops in the price of Wal-Mart and Coca-Cola’s common stock as an opportunity to acquire additional look-through earnings at a bargain price. Many corporations invest in other businesses. Under Generally Accepted Accounting Principles (GAAP), the earnings of these investment holdings are reported in one of three ways: the cost method, the equity method or the consolidated method. The cost method is applied to holdings that represent under twenty percent voting control—it only accounts for dividends received by the investing corporation. This shortcoming is what caused Buffett to expound on the undistributed earnings in his shareholder letters. Berkshire, both then and now, had substantial investments in companies such as Coca-Cola, The Washington Post, Gillette, and American Express. These companies pay out only a small portion of their overall earnings in the form of dividends and, as a result, Berkshire was accruing far more wealth to owners than was evident in the financial statements.